Legal disclaimer: This blog is for informational purpose only and must not be constituted as financial advice. Your capital is at risk in some investment options outlined here. Is that fantasy? Not really - with some planning over time this is achievable. To understand how almost anyone can do it, let us understand few basics of investment. First, have a look at the following diagram to understand different types of incomes. Active = You earn only when you work. You don't work, you don't earn (or get paid). This is typically when you earn your salary in exchange of your time. Your typical 9-to-5 day job falls under this bucket. All employees fall under this. If you are self-employed (and bill your client by hours worked) you also fall into this bucket. Passive = You earn irrespective of whether you are actively working or not! This happens when you earn from investment. Capital gain = When you buy something at a lower price and then on a later date you sell it for a higher price, pocketing the difference as profit. This includes stocks/shares, gold, lending (i.e. bonds/fixed deposits etc.) and so on. 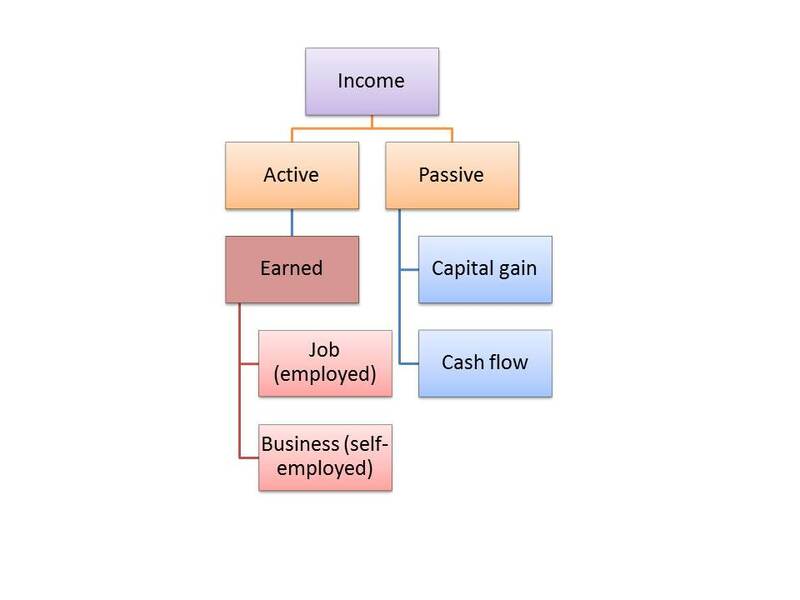 Cash flow = When you buy an asset and that asset generates regular income i.e. cash flow. This includes rents coming when you let out your properties, royalties, dividend from stocks/share, dividend from business where you have invested (but someone else is running it on a day-to-day basis) etc. Some investments can generate both capital gain and cash flow. Like properties generating rental income as well as capital appreciation over years, stocks/shares going up in value as well as generating dividend etc. If you want to earn comfortably without working, you need to focus on cash flow income. Why not focus on capital gain? This is because capital gain is often not guaranteed and bit like jam tomorrow. Share market may crash, property price might fall. Of course, some capital gain are guaranteed like government backed bonds (or fixed deposit) where you are guaranteed of a percentage return. But unless you invest massive amount of money on those schemes, returns are usually very small and would not allow you to earn handsome amount to cover your bills. On the other hand, cash flow income is frequent and you can see the cash in your hand (or bank account) regularly. Of course, there are some risks like your tenants may default; your business might start making loss instead of profit due to changing market condition and so on. Note that a prudent investor should invest for both capital gain and cash flow in using multiple routes so that in case one income stream fails others can be used as backups. So, coming back to the million dollar question - how do you generate enough cash flow to make a living without working? First, you need to calculate your outgoings. Everyone has different need and want. Assume the amount is E per month. So, your cash flow income must be I per month where I > E (obviously). Then the problem becomes how to generate I? Invariably it involves investing some capital C to buy assets which would generate cash flow. There is a proverb that you either earn compound interest or pay it. The essence of this statement is that time matters. For healthy capital gain growth you need to be invested for a fairly long amount of time. There are exceptions like short selling but that is like gambling and not recommended unless you can risk losing large amount of money. I understand it is easier said than done but it is definitely doable and plenty of ordinary people have done it.